Maria Helena de Toledo Chermont was born in Belo Horizonte, Minas Gerais, Brazil, on June 30, 1937. The extremely underrated but highly skilled Brazilian vocal stylist, famous for her partnership with Luiz Bonfá and for having been the first Brazilian singer to record with Stan Getz, died in Rio de Janeiro, Brazil, on February 3, 2010. Although she started her career back in 1947 in Belo Horizonte as half of the duo Irmãs Toledo (Toledo Sisters), together with her sister Rosana Toledo, Maria Helena only did her debut recording ("Confusão no Salão") after she moved to Rio de Janeiro in 1951. Later on, she recorded some other 78rpm discs, such as "São Jorge Guerreiro," "Pai Xangô," "Me Leva Pra Longe" and "Corre Coração" for the Chantecler, RCA and Continental labels. But fame and international recognition only came after she divorced from her first husband and married the guitar wiz and composer genius Luiz Bonfá in 1962. Their first recording session together happenned in New York, on December 26, 1962, for the album "Luiz Bonfá - Composer of Black Orpheus Plays and Sings Bossa Nova," produced by Creed Taylor with arrangements by Lalo Schifrin (who wrote the string orchestrations) and Oscar Castro-Neves (who played both piano and organ). That session included three songs co-penned by Bonfa & Toledo: "Silêncio do Amor, " "Sambalamento," and "Tristeza" (the latter also recorded a few months earlier by Norma Bengell for the soundtrack of the movie "Copacabana Palace.") But, also some months earlier, "Amor de Solidão" had been recorded by Bonfá on his "Softly..." album for the Epic label, released in Brazil by Odeon under a different title, "O Violão e O Samba." That same very productive year (1962), Bonfá & Toledo also collaborated for the first time in a movie soundtrack for "Os Mendigos" (The Beggars), a film directed in Brazil by Flavio Migliaccio, with Maria singing with Nelsinho the main theme, "Cantiga da Vida." 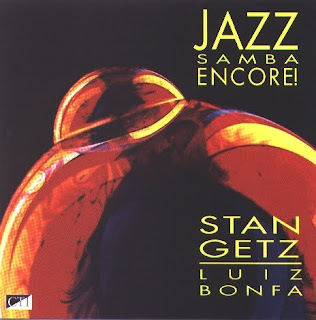 She became the first Brazilian singer to record with Stan Getz, when Bonfá and Creed Taylor decided to feature her singing on the groundbreaking "Jazz Samba Encore!" album for Verve, recorded in February 1963 at Webster Hall in New York. Toledo's name was credited on the front cover of the original LP issue as "featured artist" alongside Antonio Carlos Jobim, who played a sideman role on the sessions. 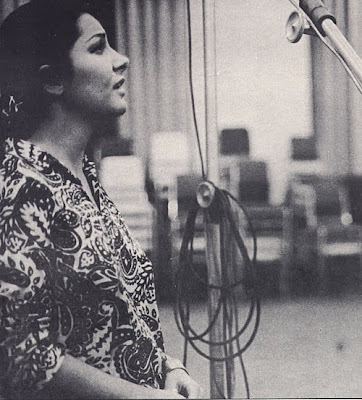 Besides the songs she co-wrote with Bonfá ("Menina Flor," "Mania de Maria," "Saudade Vem Correndo"), Maria Toledo was also featured doing wordless vocals on the opening track, "Sambalero" (aka "Sambolero"), as well as singing the Portuguese lyrics to Jobim's "Insensatez" ("How Insensitive"), a track that has been included in over 50 compilations since the original LP release in May 1963. It's worth to mention that "Jazz Samba Encore!" remained for 11 weeks in the Billboard Pop Charts, reaching # 88 in the Top 200, something very rare for a jazz album. 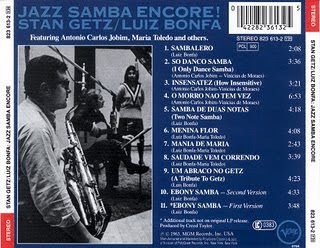 When reviewing Stan Getz's "The Bossa Nova Years" 5-LP box set released by Verve in 1989 (reissued as a 4-CD box set in 1991), DownBeat stated that Maria Toledo had been the best singer that ever recorded with Getz. In the mid-80s, "Jazz Samba Encore!" was reissued on CD by Verve, and later on by Creed Taylor's own CTI Records in 1993, with a different cover pic by Pete Turner replacing the original cover painting by Olga Albizu. Back in Brazil, Bonfá recorded a new album for Odeon a few months later, still in 1963, "Recado Novo de Luiz Bonfá," singing in all tracks. The repertoire included nothing less than eight songs co-written with Maria Helena Toledo: "Canção do Mar" (later recorded by João Gilberto in a never released session - Edinha Diniz, a close friend of Gilberto, got the mastertapes as a gift from Toledo), "Melancolia," "Reverso do Verso," "Mania de Maria," "Amor Demais," "Menina Flor," "Saudade Vem Correndo" and "Indiferença." During the Sixties, Toledo and Bonfá spent most of their time in New York, where they performed a legendary sold-out engagement at Café Au Go Go in Greenwich Village, in 1964, but they also lived and worked in Paris, London and Rome, traveling to Brazil basically only for holidays. 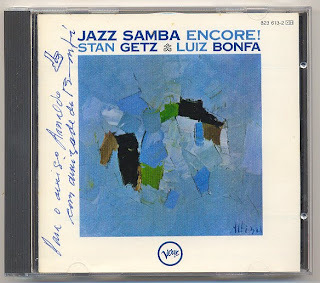 Another great Bonfa/Toledo album, "Braziliana," also recorded in NY for Philips, followed in 1965. They co-wrote such tunes as "Whistle Samba," "Até de Cavaquinho," "Pierrot," "Promessa," "Saudade," "Pequeno Olhar," "Barroco," "Boticario" and "Samburá". Produced & arranged by pianist Bobby Scott, featuring two other dear friends of mine, drummers Dom Um Romão and Helcio Milito, "Braziliana" also featured Maria's wondrous interpretation of "Tanto Amor" (co-written by Bonfá & Reinaldo Leme), probably her best recording performance ever. 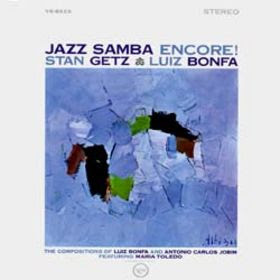 "Braziliana" was reissued on CD in the USA via the Verve Originals series, in 2008, along with "The Brazilian Scene," a more jazzier session that Bonfá recorded later that same year (1965), including another song he co-wrote with Toledo, "Zomba," also covered by Paul Winter on the "Rio" album. "Maria Toledo is a singer of much singularity," Bobby Scott, the composer of "A Taste of Honey," wrote in his liner notes for "Braziliana", praising Toledo's artistry. "It is difficult to imagine any other singer creating the atmosphere of intimacy as she can. Her soft, warm voice literally embraces the listener, and her ease of execution is still wonderment to me. Even though I have worked with her long hours in preparation for this album, it still amazes me! Maria is like Bonfá's alter ego. She writes the lyrics for his songs and sometimes even helps with the melodies. She is, in a sense, Bonfá's voice. It is really a marriage in many ways." In the words of Bonfá himself: "When Maria sings, anyone can compose the music." In NY, they became close friends of Astrud Gilberto, who often was the first to record, in the USA, new songs composed by Bonfa & Toledo such as "Tristeza" (recorded for the LP "The Shadow of Your Smile" in 1965), "Oba Oba" and "Dia das Rosas" (both included with English lyrics on the 1967 effort "Beach Samba" that became famous as the first collaboration between Eumir Deodato and Creed Taylor, to whom Bonfá had recommended the young Brazilian arranger). "Dia das Rosas" - actually a "marcha-rancho" - had been composed for Maysa and arranged by Deodato for inclusion in a song contest in October 1966 in Rio, Brazil, called "I FIC" (Festival Internacional da Canção). Another dear friend of the Bonfa's, Maysa also included another Bonfá/Toledo gem, "Hoje É Dia de Amor," on her final 1974 album produced by Aloysio de Oliveira, which has been reissued on CD by EMI as "Maysa - O Último Disco"). 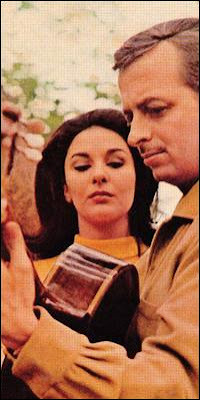 Curiously, "Hoje É Dia de Amor" had been originally recorded by Maria's sister, Rosana Toledo, as the opening track of her 1965 LP for Philips, "Momento Novo," produced by Armando Pittigliani. Both Maysa and Rosana's albums were orchestrated & conducted by my late friend Maestro Gaya. 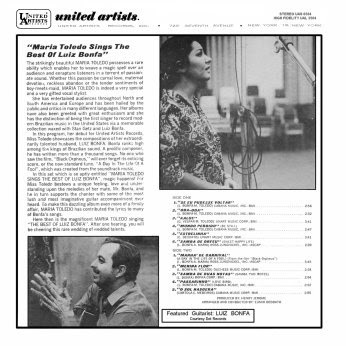 Finally, in 1967, Luiz Bonfá persuaded his friend Henry Jerome to sign Maria Helena Toledo as a solo artist for the United Artists label, for which Bonfá had just recorded the soundtrack of the movie "Pour Un Amour Lointain". The result was a fabulous LP, "Maria Toledo Sings The Best of Luiz Bonfá," arranged & conducted by Eumir Deodato, with an all-star cast: Ron Carter, Dom Um Romão, Bobby Rosengarden and Tony Motolla, amongst others. Btw, that was Deodato's first session in the USA, recorded a week after he arrived in NY invited by Luiz Bonfá, who paid his airflight ticket and also provided Deodato with enough work so as to allow him a minimum income in his first year in the Big Apple. 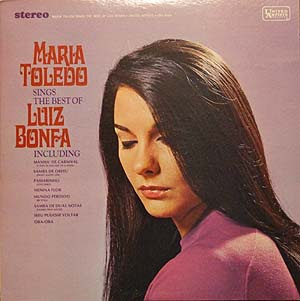 Despite the album title, "Maria Toledo Sings the Best of Luiz Bonfá" also included songs by other composers like Deodato (the lovely "Estrelinha," which received a lot of airplay at the JB-AM radio station in Brazil, in spite of the fact that the album was never released there), Cartola & Elton Medeiros ("O Sol Nascerá") and Geraldo Vespar ("Kaluê," with lyrics by Maria herself, the track chosen by United Artists to be released in a 45rpm single together with "Manhã de Carnaval"). Toledo also did a marvelous job on the haunting ballad "Se Eu Pudesse Voltar" (my personal favorite track) as well as on the slow bossas "Oba Oba" and "Mundo Perdido", on the uptempo "Samba de Duas Notas" (lyrics by Bonfá himself) and on the exquisite "Passarinho" (Love Bird). Maria Toledo appeared in many other Bonfá albums, including "Black Orpheus Impressions" (scatting/dueting with Luiz on "Dois Amores" and also offering another fine version of "Manhã de Carnaval", this time as a guitar/vocal duo), "The New Face of Bonfá" (its CD reissue was produced by Arnaldo DeSouteiro for BMG in 2003), "Jacarandá" (a fusion masterpiece also reissued by DeSouteiro) and "Manhattan Strut" (a delightful funky-jazz adventure that became an acid-jazz classic). She also wrote the Portuguese lyrics to "Canção do Encontro", the Portuguese title to another jazz standard composed by Bonfá, the title theme from his wonderful "The Gentle Rain" soundtrack. "Canção do Encontro" was recorded in Brazil by the vocal group Quarteto 004. In her only recording session without Bonfá after their marriage, Maria Toledo did background vocals for Astrud Gilberto's "Now" album, cut in NY in 1972 and reissued on several digital formats, including DVD-Audio, in 2002. By the end of 1974, Bonfá and Toledo decided to live once again in Brazil, in a beautiful house in Barra da Tijuca, Rio de Janeiro. They started to record an all-star project with João Donato, Novelli, Nelson Angelo, Alayde Costa, but it was never released and they eventually divorced two years later. Feeling very sad, Maria never got over the loss, and retired as a singer. In the 90s and 2000s, her songs and recordings appeared in many compilation CDs produced by Arnaldo DeSouteiro (as well as on the original album "Almost In Love - Ithamara Koorax Sings The Luiz Bonfá Songbook"), Thievery Corporation ("Sounds from the Verve Hi-Fi"), Masters at Work ("Stop and Listen Vol.5"), Dario Cominesi ("Sister's Lounge") and Daniel Haaksman ("Bossa do Morro"). Not to mention the many movies - most notably "The Pallbearer" - on which the recording of "Sambolero" (taken from the "Jazz Samba Encore!" album) was included on their soundtracks. She is survived by her only son, Mario Toledo (from her first marriage), grandson João Victor and granddaughter Valentina, and her sister Rosana Toledo. thanks for posting... after hearing her on Jazz Samba Encore! about 10 years ago, i tried to find more info on her but to no avail. this is most text I've seen on her in one place. Onde posso conseguir o disco Maria Helena Toledo sings the best of Luiz Bonfá. Existe nele música de grande valor afetivo chamada "Estrelinha" que como vc esclareceu não é do Bonfá. Cumprimento vc pelo belo trabalho que realiza pela nossa melhor música, haja vista o disco da Paula Faour. 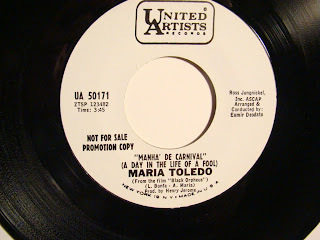 I have been searching for any information about Maria Toledeo for over a decade.Maria Toledo is probably one of the best vocalists this world has ever had. She possessed such a wonderful voice. Paired with Bonfa's guitar, i think their compositions are nothing less than amazing. I listen to Braziliana almost everyday for so many years. I started to learn Portuguese becuase of this music. Sadly Maria just passed away. Yet her legacy will always be here. Thank you for the beautiful obituary. Maria Toledo's voice and talent has touched my soul ever since I heard Jazz Samba Encore as a child. 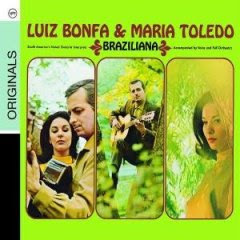 As I got older I searched out her music and discovered Braziliana & Maria Toledo Sings the Best of Luiz Bonfa. Maria Toledo Sings is one of my favorite albums ever. Apart from knowing she was married to Luiz Bonfa, I knew nothing else about her. She will always have a place I'm my heart.